The Bar With No Name is quite possibly one of London’s best kept secrets; so we thought it would be only fair to share it with all of you! Located just outside Central London; within close proximity to the tube stop Angel, guests visiting the bar will find themselves in an intimate, cosy setting embracing décor of the American Moonshine era whilst being dazzled by the captivating cocktails created by the vastly talented Tony Conigiliaro. Tony Conigiliaro the man behind the bar with no name is widely acknowledged as one of the UK’s most innovative drink creators, and continually strives to explore new ways in which guests can enjoy their drinking experience. To date Tony has been exposed to a wide range of experiences, having worked as a bartender in the following premier cocktail bars; Isola and Shochu Lounge in London. It was in this period Tony began collaborating with the UK three star Michelin Chef Heston Blumenthal to create the cocktail menu at ‘The Fat Duck’; which as I am sure you agree is a true testament to his skill. In accordance with Tony’s desire to revolutionise our drinking experience he has personally devised exclusive hands on and informative masterclasses exclusively at the bar with no name. In light of the festive season fast approaching Kate and I could not resist taking part in the Holiday Masterclass. As we approached the front door of the Bar With No Name, we were incredibly excited for the masterclass awaiting us. On arrival we were presented with a breakdown of the drinks we would be making, which included the type of glass required, ingredients and suitable room to make additional notes before being shown to our seats with a great view of the bar. From the onset we became infused with the upbeat, happy atmosphere that had been created by a combination of eager fellow pupils and staff members. The class was evenly spread out in terms of gender, age and geographic background meaning it was very easy to begin chatting with one another before the drinks had begun flowing. The masterclass began with an alcoholic egg-nog with freshly grated nutmeg on top; the taste was deliciously sweet with a truly homely, winter aroma. As we sipped on our egg-nog we were educated in the drinks contents and origins, which are actually English rather than the popular misconception of American/Canadian before being introduced to both Tony and Martha that would be taking the masterclass. The masterclass followed the format of us watching, taking notes and asking questions about the drink whilst the Tony and Martha created enough for us to share among small groups (straws provided) and comment on before volunteering to go behind the bar and recreate the drinks ourselves. 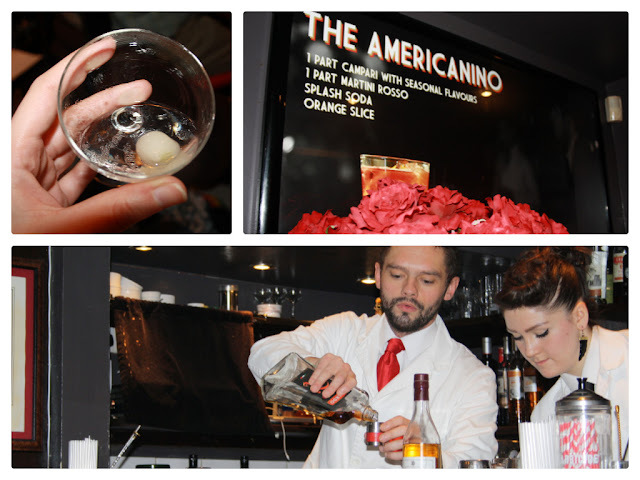 The first drink within the Holiday Masterclass collection was the Sicilian Sour; with Amaretto Disaranno. 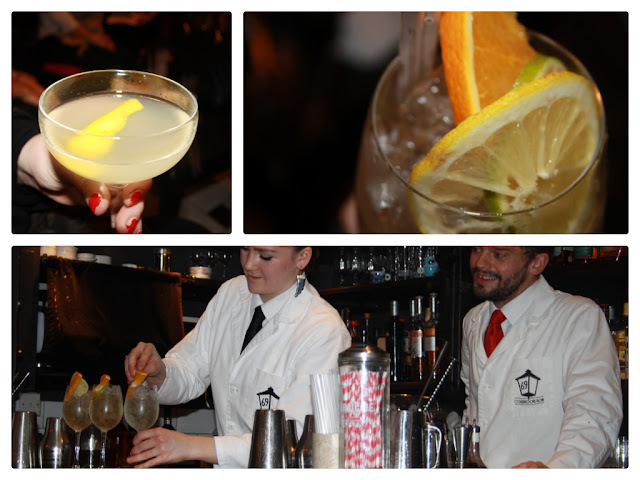 As the drinks were being created with masterful precision we were talked through the origins of the drink; and told that at the No Name Bar their signature on this drink is a Star on top. The taste of this drink was truly divine; and although the next eight that followed tasted great this was our favourite from the onset. Arguably; the most fun and indeed challenging part of the masterclass was getting behind the bar and creating the drink yourself. I will say this is something that defiantly looks easier than it is in reality; I fear I will defiantly require some additional training before I can create drinks like Martha and Tony! Throughout the Holiday Masterclass we made the following drinks: Classic Champagne Cocktail made with Perrier Jouet NV Champagne, Alfonso Cocktail which we were told was enjoyed by the late Queen Mother, the 1920’s London classic Hanky Panky, Sherry Cobbler which was the first drink to incorporate ice, Tom Collins a gin based afternoon drink that soared to popularity in New York as a result of a genius joke, Golden Fizz served without ice and topped with soda water, Corpse Reviver N2 which we believe could truly wake the dead and finally Scoff Law a popular drink in the Prohibition era. Despite these being listed as the Holiday Masterclass selection; both Martha and Tony were happy to engage in debates, and in one example created an additional drink for us guests to enjoy to further enhance a point made regarding the taste of the classic Martini. We really enjoyed this masterclass; it was the perfect blend of education, insight and hands on interaction. The amount of alcoholic drinks whilst impressive was staggered in a way that even after your sixth or seventh drink you were only tipsy at very best, which meant you were able to really appreciate what was going on. To put it quite simply; this masterclass is truly unique, and a fabulous treat for the Holiday season.